Buzz Electrical Ltd has won ‘Small Apprenticeship Employer of the Year’ and ‘Apprenticeship Employer of the Year’ for 2018 at this year’s Worcestershire Apprenticeships Awards. The awards, organised by Herefordshire & Worcestershire Chamber of Commerce, were held in November at Tree Tops Pavilion, Midlands Safari Park. 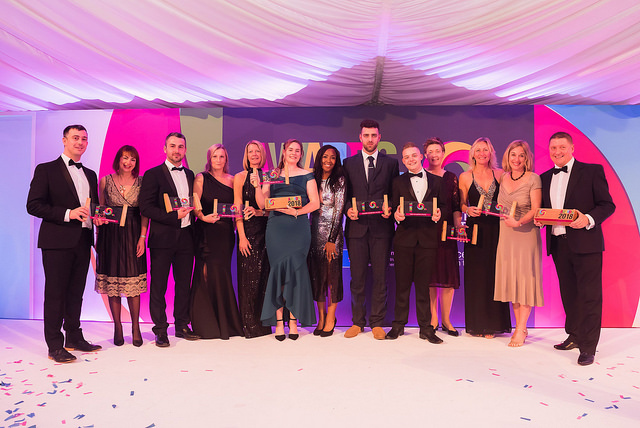 Hosted by Angellica Bell the event was attended by 350 guests, including 25 of the county’s best apprentices, employers, training providers and schools. Based in the Vale of Evesham, Buzz Electrical has been providing electrical services and installations throughout the Midlands, Cotswolds and further afield for residential, commercial and industrial clients for 19 years. Managing director and founder of Buzz Electrical Ltd, Steve Owens said, “It was such an achievement for us to win these awards, to be recognised by our business counterparts for all the work we have put into our 18 apprentices over the past 19 years. Without our apprenticeship programme, Buzz wouldn’t be what it is today.